its first product, an iPad app. Thunder fans who are ranting off-topic. 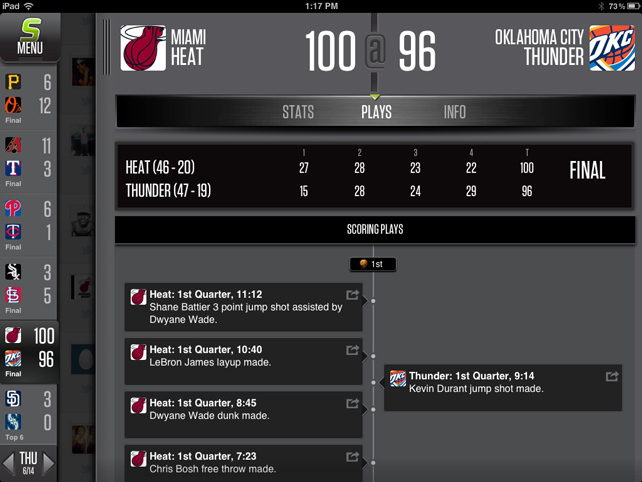 SportStream includes play-by-play, allowing you to quickly tweet about a specific highlight. everyone makes the cut to appear in the stream. “That part is pretty tricky,” says Morgan, who’s as tight-lipped about his semantic algorithm as Stephen Strasberg is about his curve ball. It’s no wonder Allen sees a business opportunity. According to Forrester, as many as 85% of tablet owners make a daily habit of using the TV and tablet simultaneously; according to Nielsen, an equal percentage of smartphone owners double-dip using their screens at times. Along with TV shows, sports continues to be one of the most tweeted-about topics. Last year’s Super Bowl set the sports record, with 12,233 tweets per second. That’s a lot of noise. 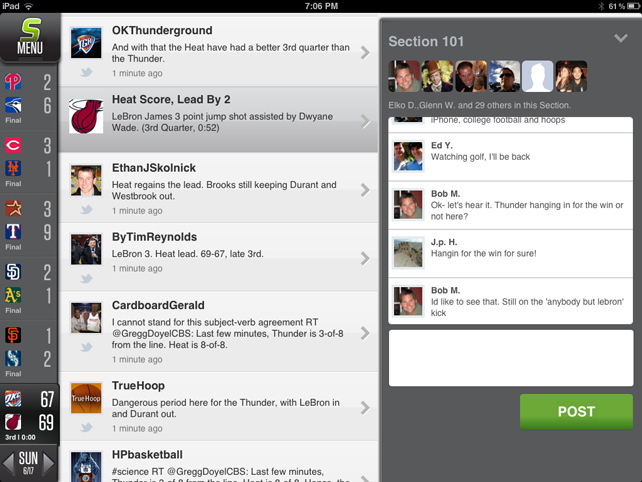 After checking in to a game, you see the corresponding tweet stream and can converse with other SportStreamers. who downloaded the iPad app throughout the days: When’s the iPhone app coming out? plan to offer a premium version for subscribers and to integrate sponsorships. users have asked to limit the comments stream to the people they follow. about his hometown Celtics and Red Sox.